Can we use remote sensing to assess the ecosystem benefits of biodiversity? In our Dimensions of Biodiversity project we found one option: spectra of light reflected from plants. In our recent paper in Nature Ecology & Evolution, we show that reflectance spectra of plants provide highly integrative measures of plant function that are tightly coupled with their evolutionary history. At the plant community level, spectral diversity predicted ecosystem function - a result scalable to remotely sensed images. But how did this spectral journey begin? We know from past research, such as the biodiversity experiment at Cedar Creek - a Long-Term Ecological Research site, north of Minneapolis: more diverse plant communities function better and more efficiently. Diverse plant communities produce more biomass, are more resistant to disease and invasion, more stable over time and recover faster after disturbance than less diverse communities. Like many others, I am fascinated by the findings and implications of the biodiversity-ecosystem function research. And I wonder whether remote sensing can be used to assess biodiversity and ecosystem function, which would be extremely valuable especially in ecologically sensitive areas that are difficult to access. In the summer of 2015, I joined the Dimensions of Biodiversity project “Linking remotely sensed optical diversity to genetic, phylogenetic and functional diversity to predict ecosystem processes”, co-funded by NSF and NASA and led by Jeannine Cavender-Bares, John Gamon and Phil Townsend. 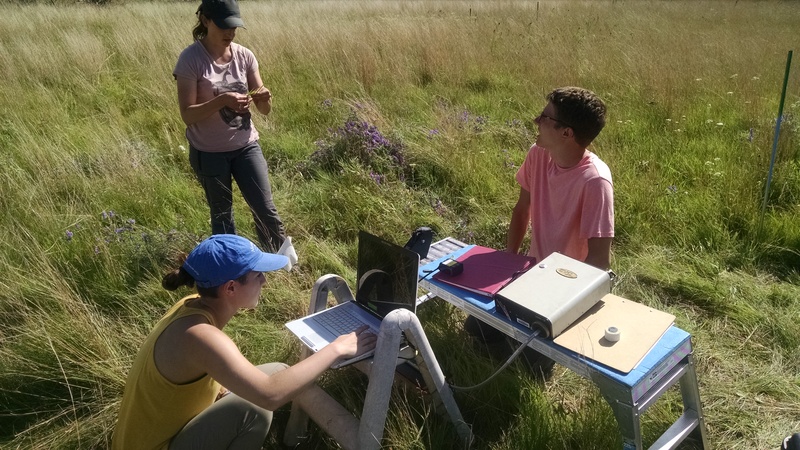 The field team and I were collecting leaf-level spectra in Cedar Creek’s biodiversity experiment, comprised of plots of prairie plant species with different diversity levels. Our first aim was to use these measurements to map a range of chemical vegetation traits from reflectance spectra collected by airborne instruments like NASA’s AVIRIS NG imaging spectrometer. When light interacts with matter, scattering occurs at the interface of different media, and the molecular composition and arrangement of molecules in the material determine how much of the radiation at which wavelengths gets absorbed, transmitted and reflected. I had experience with predicting foliar chemistry from spectra of plants and with scaling these estimates to the plot level, which can then be matched to remotely sensed image pixels. So I was confident that our chemical models would turn out well, given that we would capture the plants spectral variability in a sufficient number of research plots. Collecting plant spectra. Erin Murdock, the author and Brett Fredericksen measuring prairie plants at Cedar Creek in 2016 (photo by Lewis French). After the first couple of days, it became clear to us that this would be a larger effort than we had anticipated. The inter- and intraspecific differences among plants growing at different diversity levels were obvious and we decided to extend our sampling design. This gave me plenty of time to look at plants, measure them spectrally and think about our overall project goal: developing methods for remote sensing of biodiversity. What do mean by remote sensing of biodiversity? - What aspect of biodiversity do we want to capture? Biodiversity assessments often involve more than counting the number of species. To build a strong argument for protecting and restoring biodiversity globally, it is important to quantify the services biodiversity provides for us, including nutrition, clean water and air, safety, health and enjoyment. This involves integrating multiple dimensions of biodiversity: genetic, taxonomic, phylogenetic and functional diversity, at the individual, community and ecosystem level. Can spectra of light integratively capture the differences among plants that are causing the benefits of biodiversity? One ecosystem function that is central to several ecosystem services is aboveground productivity. As the weeks progressed, we observed what had been quantified before: most species were growing better in diverse environments. With time, more subtle differences among individuals within plots also became apparent. We knew from previous studies that both inter- and intraspecific differences in plant traits matter for ecosystem function. Seeing these differences again and again - with our eyes that are sensitive to only the visible portion of the electromagnetic spectrum - reinforced our idea: spectra of plants measured in the visible, near-infrared and short-wave infrared regions integrate more of the total variability in plant traits than the selected set of traits we traditionally measure. Spectra reveal functional differences among plants. 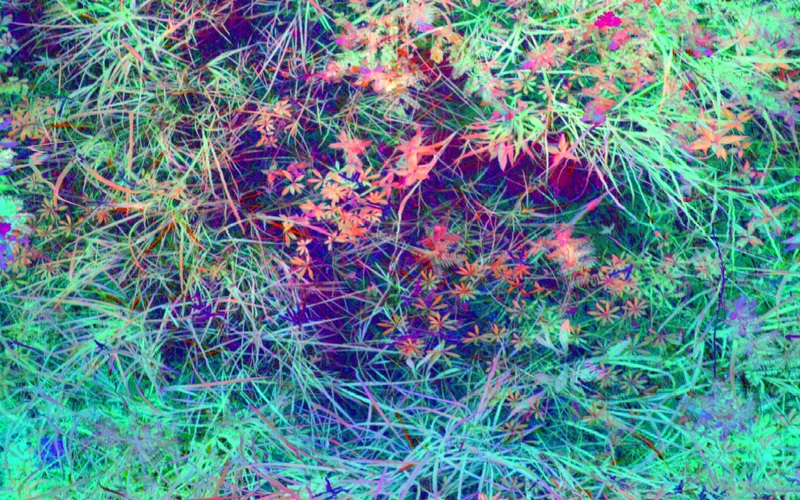 False color image based on three spectral indices: red is SIF (sun induced fluorescence), green is NDI (chlorophyll normalized difference index, a chlorophyll content indicator) and blue is PRI (photochemical reflectance index, indicating photoprotection and plant stress; image by Ran Wang). These observations led us to use the dissimilarity of spectra to describe functional differences among plants. We found that more spectrally dissimilar species were more functionally dissimilar and more distantly related. Moreover, the spectral diversity of plant communities calculated from leaf-level spectra predicted as much or more of the total variability in aboveground productivity than functional, phylogenetic or taxonomic biodiversity metrics. When calculated from high resolution images of plant communities, even without any information about species identity or abundance, spectral diversity predicted ecosystem function to a similar extent. For this test of scalability to the remote sensing level, we used an imaging spectrometer mounted on a mobile tram at about 3 m above the ground, obtaining a pixel size of approximately 1 mm2. Proximal remote sensing with an automated tram system. 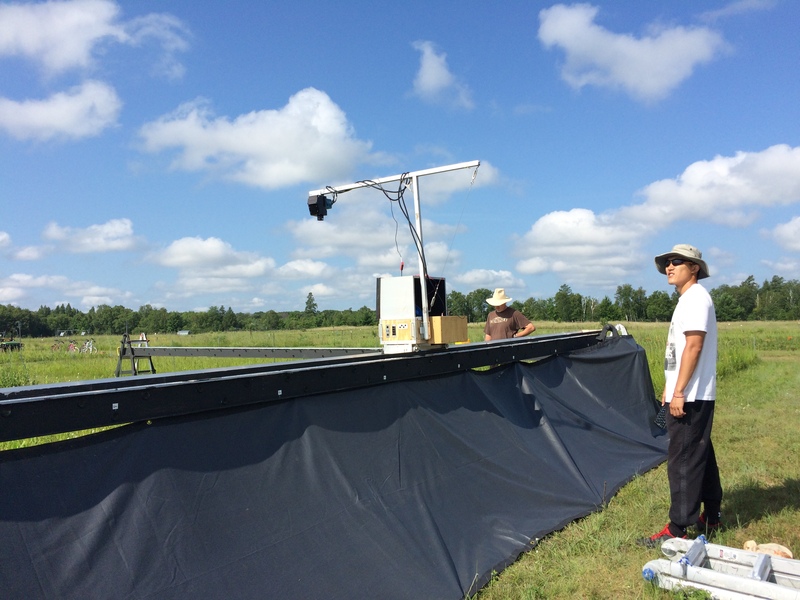 John Gamon and Ran Wang (front) collecting spectral images in the Cedar Creek biodiversity experiment in 2015 (photo by the author). High spatial resolution images, with pixels smaller than or matching the size of individual plants, can be acquired from low flying unmanned aerial vehicles and in some ecosystems, such as forests, also from high resolution airborne data. We look forward to testing our spectral diversity metric across contrasting ecosystems, especially using small remote sensing devices. Understanding how our findings translate to larger image pixels that blend together spectra of individual plants will be an important aspect of our future research. We anticipate that our efforts will lead to improved operational remote sensing methods of assessing biodiversity and ecosystem function.